Ancol Ergo Moulting Comb is designed specifically for grooming dogs that are shedding their coat. Two different lengths of teeth ensure that loose, uncomfortable hair is gathered from both the top coat and the undercoat. 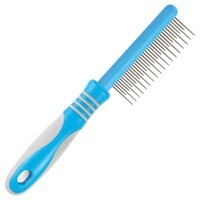 Use this comb regularly to keep your pets looking healthy and tidy. For more information on grooming your dog, please check the information provided on the back of the products packaging.